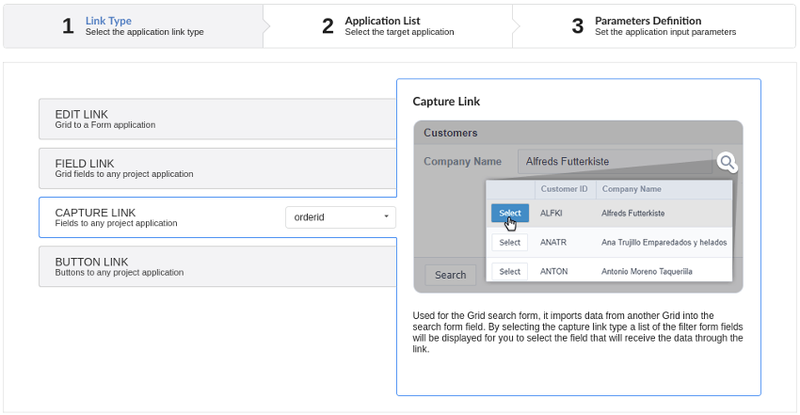 The capture link is used to return a value from a Grid to a Form field. In the types of links options, we will choose the Capture Link. After selection this option, we should also choose which field we want to return the value of. After we select this option, will be displayed the applications list to what you want to create the link. Clicking in the button, you will be taken to the target application to create a parameter, so you can use the update button in the parameters definitions to refresh them. In this option we are going to define if the target application will be opened in a Modal. Yes: This option will make the target application be opened in a modal. No: This option will make the target application be opened in a new window. If Yes is selected in the previous option, the Modal’s Height and Width will be available. If No is selected in the previous option, only those options will be available. When we select the option Yes, the button New is created in the grid to insert new registers. Indicates which shortcut key to the button add new register.